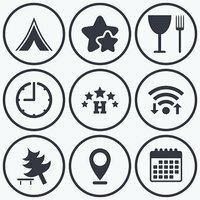 Food, hotel, camping tent and tree signs. Sun Sunburst Pattern with lens flare. Blue sky. Lifebuoy with red stripes and rope (salvation). Symbols amenities hotel. Signs set motel services.